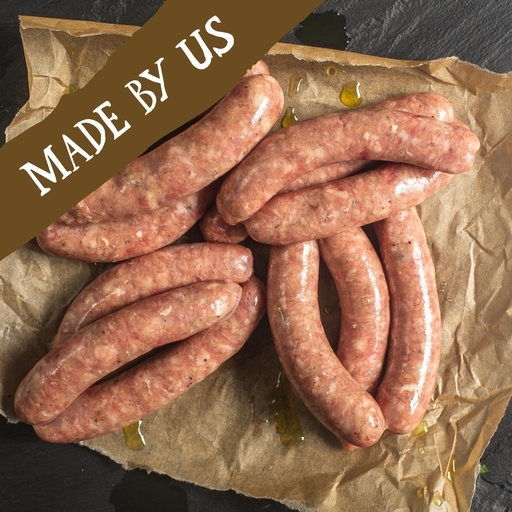 Fresh organic pork chipolata sausages from the Riverford butchery. Quick to cook for weekday meals, or wrap up in bacon for succulent pigs in blankets. Three things make our bangers brilliant. First, we make them with prime quality meat. Second, we don’t over-manufacture, so they stay coarse and meaty. Finally, we use natural casings to enhance the flavour. Oil lightly and fry or grill on a medium heat for 8-10 mins until completely cooked through to the middle, turning frequently so that they colour evenly. Alternatively, cook them in an oven preheated to 180˚C/Gas 4 for 15 mins, turning halfway through. Pork (89%), water*, seasoning (breadcrumbs (wheat flour, yeast*, salt*), potato starch, sea salt*, ascorbic acid E300*, white pepper, ginger, sage, sugar, nutmeg, black pepper, thyme, rosemary extract), natural sheep's casings.